Today is the last Sunday in Lent before we enter Holy Week. It is not surprising, therefore, that our gospel story brings us to the very threshold of the events which would culminate in the Holy Week. But many would be distracted by what they see or rather not see. But the Church does not intend for this to be a distraction. On the contrary, it is meant to help us keep focused. Of course, I am referring to the covering of the crucifixes and all the images this Sunday. 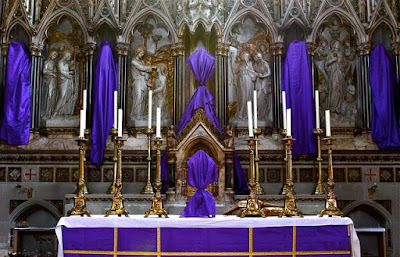 Many are familiar with the wider practice of the veiling of the crucifixes and images that takes place after the Mass of the Lord’s Supper on the evening of Holy Thursday in preparation for the unveiling on Good Friday, but having these already covered on the Fifth Sunday makes no sense. 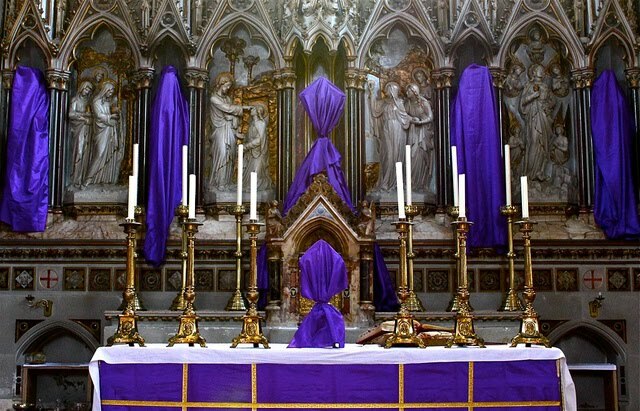 Well, veiling the crosses and images on the Fifth Sunday of Lent is an option in our liturgical books but, why? What does this ancient practice mean? In the old liturgical calendar before the reform, the season within a season beginning with the 5th Sunday of Lent was called the Passiontide due to the fact that the Passion account of our Lord was read on this Sunday, Palm Sunday and Monday to Wednesday of Holy Week. In the old liturgy, the Sunday’s gospel had this concluding sentence: “But Jesus hid Himself and left the temple” (John 8:59). The great nineteenth-century Benedictine liturgist Dom Prosper Gueranger gives a mystical interpretation to the veiling in relation to this gospel. Just as Jesus hid Himself from the Jews who wanted to stone Him, so by the veils He is now hidden from the world in preparation for the mysteries of His passion. How about the statues of the saints? Well, the statues of the saints are covered too since, if the Master Himself is covered, so should be His servants. Another spiritual interpretation of the veiling is based on the fact that in Christ’s passion, not only was His divinity obscured but so was, in a certain sense, His humanity. He was so disfigured by the blows and scourges that He was hardly recognisable as a human being. Why were these Greeks looking for Jesus? The gospel tells us that they had come to the festival for worship. They may have heard many reports about the Lord, including the recent news that He had raised Lazarus of Bethany from the dead. Different people looked for Him for many different reasons. The Scribes and the Pharisees looked for Him in order to trap Him in their theological quarrels. The Elders and the Chief Priests were always looking for Him to kill Him. Herod the Tetrarch longed to see Him, perhaps out of curiosity. The crowds looked for Him because they wanted some bread and more miracles. The sick looked for Him in search of healing and consolation. Mary Magdalene looked for Him in search of forgiveness. Are you also looking for Him? The words of these Greek Gentiles mirror the desire to find some sort of “God” that is found in most if not all cultures throughout human history. There is in the heart of every human being a natural thirst for God, which nothing, except an encounter with Him, can ever totally extinguish. This thirst for God is felt by everybody, including those who claim not to believe in Him or those who have no name for Him. Notice how this thirst becomes more pronounced whenever we are in dire straits. In times of doubt, when we experience the darkness of prayer and the dimness of faith, we pray, “O God, I would like to see Jesus.” In times of bodily or mental pain, we pray, “O God, I would like to see Jesus.” In times of loss, when our grieving is unbearable, we pray, “O God, I would like to see Jesus.” Many of us want to see Jesus only because we want Him to solve our problems and, possibly, make our lives easier. Perhaps, there is another reason why so many can’t see Christ of God. We need to realise that it is we who are actually doing the hiding and God is doing the seeking. Due to the Fall, our likeness to that of God has become hidden and veiled. And because of our own personal sin and just like our first parents, we have often “hid from God” and not frequented the sacraments, out of shame. We hide ourselves from God because we wish to hide our shame and our insecurity. It is not Christ who hides Himself. It is us sinners who choose to hide from Him. In a world that is losing its sense of purpose, these simple liturgical actions do have a rich mystical and spiritual meaning and purpose, pointing to a spiritual reality that is often hidden from a world that wears materialistic blinkers. Many continue to desire seeing. However, this desire may be felt in different degrees. In some, it is so ardent that it becomes a conscious daily longing. In others, it is so faint that it is hardly noticeable, because it has been suffocated by other worldly substitutes. The consoling thing is that Jesus also wants to see us too. That is why He came into the world. As we seek to encounter Him, He also seeks to encounter us. And so, we pray, we plead, we beg the Lord for this one request, “we would like to see Jesus.” And so we will. If you want to see Jesus, come to the table of the Word and the Eucharist, and you will find Him there. So, as the Church veils and unveils the Cross and sacred images, remember who it was who first veiled Himself to us, and then unveils us of our shame and sin.